You are a dance teacher. Why did you decide to compose a song? I also usually put a lot of poems in social networks. Once, one of the most famous Cuban singers saw one of them and asked me if he could put it to music. I accepted happily. After a long exchange of e-mails and messages, it didn't work out, but that's how I realized that this text was good for singing. I wracked my brain about which singer I would like to give life to the songs, and immediately I thought of Pedrito Calvo Jr. As he says, as soon as he read it, he fell in love with the lyrics and everything else came very fast. Demos, rehearsals, 1000 messages, coming up with the title together, recording, put it on sale and finally the video clip in which I dance along with Leysis Smith, David Del Campo and several others. So far it has been very popular, as it passed 300,000 views on Facebook in a month and a half of being uplaoded and it is being played in clubs around the world. I point out, as if winking, that I was also a caricaturist, I drew and designed the cover of the CD. 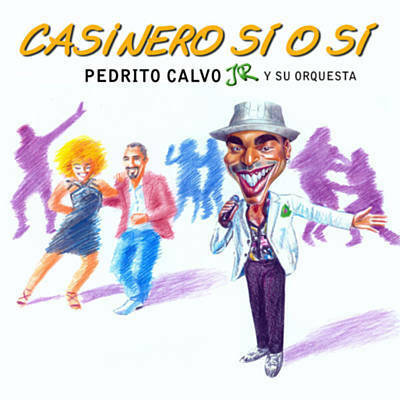 Tell us about the collaboration with Pedrito Calvo Jr. The collaboration with Pedrito Calvo Jr. was exceptional. The naturalness and spontaneity with which we communicated without even knowing each other was astounding. I often say that with this project I first and foremost gained a friend. Everything flowed between us, the waters were crystal clear. Here I must pay homage to WhatsApp because that was the greatest medium through which we crystallized, we concretized this great project. And I can not fail to emphasize how much I marveled at the musical result that Pedrito and his orchestra achieved with my words. The video was entirely designed by Pedrito Calvo Jr. and the Italian cameraman with whom he worked. We were fortunate to have great dance professionals like Leysis Smith and David Del Campo, who came from other cities from Italy to Milan, where we filmed the second part of the video. The first, which none of the three of us was in, was made in Empoli with the logistical support of a drone that filmed the ruedas de casino wheels from above, for example. Above all things we were fortunate to have the presence of many dancers from various Cuban dance schools in the region. In spite of being scorched with heat, dancing for our video clip in front of the Duomo of Milan was one of the best artistic experiences that I have had. Where can you buy the single? Are you going to continue composing? As I always wrote poems and prose, in Spanish and French, this being a lyricist gave me a further incentive on the literary plane. So I already have several other lyrics that are waiting to be sung; Pedrito Calvo Jr. will surely use one of them and the others ... we'll see. Please tell us a little how you see the relationship between music and dance? That is to say, music is what inspires the dancer but how much or how do you think that dance also contributes to music and its worldwide diffusion? As a dancer and an international dance teacher, I don't know if I will be very objective when it comes to talking about it, but I think, frankly, that the dancer is the ambassador of music. Cuban music is danceable by its essence and almost by definition. I am speaking of son, chachacha, mambo, timba, rumba, among others, and not, for example, the trova or the new trova. Each thing bears its own, and what is born of the son complex and the rumba complex is made to be danced. Thus, the worldwide boom that these dances have taken (on a personal level I have taught even in countries such as Mongolia, Bahrain, the Philippines, and Azerbaijan ...) shows that the intrinsic relationship between music and dance is, playing with the articles of both words, a true union of partners. Of course the music is first. But the dancer takes her where she has to be. Click here for Liz Anaya's English translation of "Casinero Sí o Sí"